You can find instructions online for any nearly any project you can imagine. Do-it-yourself videos allow you to save money and learn new skills. DIY can be great! But there are certain things that should be left to the professionals, such as straightening your teeth. DIY braces may seem appealing to avoid having to pay for treatment, but they can have dangerous consequences. Even at-home straightening solutions like mail order braces don’t come without risks. Check out these four reasons why you should turn to a dentist in Lakewood Dallas to straighten your teeth with a proven solution like Invisalign rather than go it alone. DIY braces use everyday objects, such as rubber bands, paper clips, dental floss, superglue, and hair elastics to force teeth into the desired position. From the start, you can experience problems because these items are not medical grade or sterile, increasing your risk of infection especially if you cut into the gums. Excessively tight DIY braces can also cut off necessary circulation to your tooth, possible leading to tooth loss or permanent damage. In contrast, your dentist has the necessary training, equipment, and supplies that are specifically designed to straighten your teeth and can make sure that your smile remains healthy throughout the process. When you attempt to straighten your teeth on our own, through DIY braces or even mail order braces, you never really know what you might end up with. Although mail order braces use dental professionals to create your treatment plan, you perform the impressions that are used in that treatment plan yourself. If you make a mistake, your treatment plan could be impacted and leave you with results that aren’t completely straight. By using Invisalign through your dentist, you know that you are getting accurate treatment from the start and that you will get amazing results in the end. With DIY braces, you can easily end up causing more damage than good emotionally and mentally as well as physically. Also, because you never interact with a dental professional with mail order braces, if any adjustments need to be made with your treatment plan or if you need to reorder a certain lost alignment tray, you’re stuck waiting for hours on customer service calls. Your dentist is more easily accessible and able to adjust your treatment plan according to your needs. Yes, straightening your teeth through your dentist costs more than DIY braces or mail order braces. However, if you experience any of the potential complications or even just do not get the desired results, you may end up paying much more to fix the problem in the end than if you had turned to the dentist in the first place. 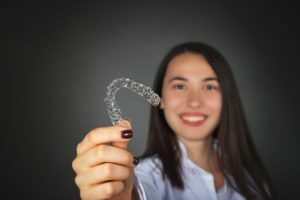 When you weigh the risks of DIY braces and solutions like mail order braces, any inconveniences and costs of Invisalign with your dentist suddenly seem much less important. It is worth the time, effort, and money to make sure that you straighten your teeth in the safest and most efficient way possible. That way, you can enjoy your healthy, happy smile for years to come. While in dental school, Dr. Drew Vanderbrook was voted to serve as class president. Since graduating from the Baylor College of Dentistry, he has continued his dedication to education through courses with prestigious organizations like the Spear Center of Dental Excellence. In his practice, he is certified in Invisalign and offers this service to his patients. To make an appointment with him, you can call (214) 821-5200 or click here.